In addition to connecting with Sisters and friends and conducting Sorority business, National Convention is a time to recognize individual and chapter achievements. The Ada A. Norton Award honors an alumna who, through longevity, has demonstrated outstanding service to the Sorority in an effective, creative, and dedicated manner. The Anchor Award honors an outstanding alumna in good standing who has given exceptional dedication and faithful service to her alumnae chapter and community for a minimum of five years. The Carrie W. Staehle Award honors an initiated Chapter Advisory Board member for exceptional service to their chapter and to the Sorority. The Order of the Yellow Rose honors an alumna who has given long, faithful service or for the successful performance of a special project for Alpha Sigma Tau. The Mary Louise Mandrea Doyle Panhellenic Award honors collegians, alumnae, or collegiate or alumnae chapters who have made outstanding contributions to the Greek cause on a campus, in a community through Panhellenic service, or to NPC. The McCrory Order of Interfraternity Excellence Award honors an individual who has contributed outstanding service to the betterment of the fraternity/sorority system. The DeCamp Philanthropy award is presented to collegiate and alumnae chapters/associations that demonstrate an outstanding commitment to philanthropic endeavors. Formerly the Elizabeth Wilson Award for Chapter Management, this award is presented to the collegiate chapters exhibiting excellence in chapter operations and management. The Edward Jervey/Martha DeCamp Award honors the collegiate chapter that has exhibited in all of its actions the highest adherence to the ideals and integrity of Alpha Sigma Tau as set forth in the Creed. The Founders Award honors the collegiate chapter that is outstanding in all facets of Sorority, college, and community life. Presented to the chapter(s) with the highest average chapter GPA each semester. Presented to the chapter(s) with the greatest improvement in chapter GPA each semester. Presented to collegiate chapter(s) achieving both individual and chapter academic success through academic programming efforts. Presented to the collegiate chapter(s) demonstrating active engagement in their campus and Panhellenic communities. Presented to the collegiate chapter(s) exhibiting the best use of marketing and communications. Presented to the collegiate chapter(s) exhibiting the best values-based chapter promotional video. The Membership Excellence Award is presented to collegiate chapters that have exhibited a culture of excellence in membership recruitment and retention. The Membership Improvement Award is presented to collegiate chapters that have exhibited significant improvement in membership recruitment and retention results. 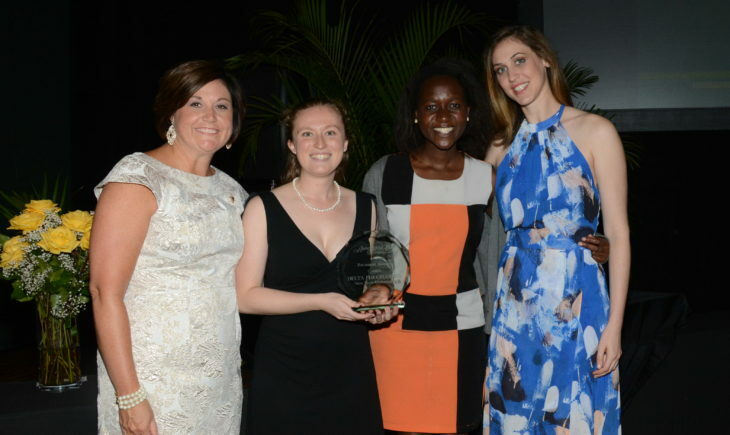 The Illuminate Leadership Award honors collegiate chapter(s) that have achieved group or individual leadership enhancement resulting from participation in Illuminate programming. The Scholarship Award is presented to collegiate chapters achieving the highest grade point average each academic term. Presented to the collegiate chapters exhibiting excellence in financial management and health. Presented to the collegiate chapters exhibiting excellence in risk prevention, reduction, and management measures. Presented to the collegiate chapters exhibiting excellence in the cultivation of healthy, interpersonal relationships, and accountability. 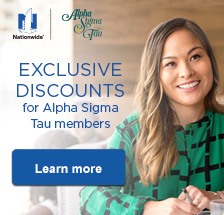 The Mary Charles Adams Ashby Convention Top Tau Award – named after Past National President Mary Charles Adams Ashby, Chi – honors an outstanding alumna and collegian who embody the values of Alpha Sigma Tau during Convention.